I was looking to find a SIP softphone that is portable - targeting Windows, Linux and MacOSX. 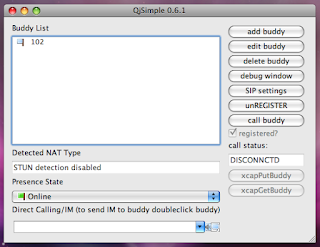 One of the most important features: handy for developers playing with SIP and VoIP. So far, I worked mainly on Linux and there the old (obsoleted?!?!) KPhone did (still does) a great job. There are other free softphones, Twinkle is one of the best, but I needed something for MacOSX. Few weeks ago I checked QjSimple, a project led by Klaus Darilion (which is also developer and management board member of Kamailio SIP Server). It uses pjsip library and has QT interface, porting was piece of cake - just some Makefile update. Now, version 0.6.3 is offcially available for Windows, Linux and Mac OS X.
FlySpray is a lightweight bug tracking system that uses dokuwiki syntax, therefore any syntax plugin for dokuwiki should work out of the box for it as well. Unfortunately FlySpray accepts only plain text in the "Close Task" description, so the GIT reference does not work there, yet. 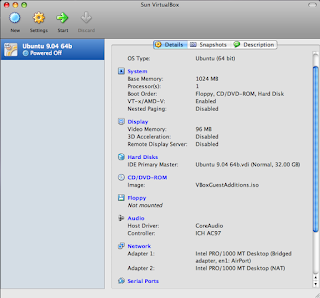 I am quite impressed by the last release of VirtualBox, the 3.0.x, it runs fast using low resources. Having Ubuntu 9.04 as guest on Mac OS X goes smooth, the auto-detected focus makes usage of keyboard and mouse straightforward. The only problem I encountered is using bridged network mode with airport. I get IP address via dhcp, setting for dns, but the gateway is not reachable. The other computers in the network are visible via IP, but access to internet doesn't work. I need this mode so other nodes can connect to guest OS on my laptop -- here falls the SIP phones I used to test the development of Kamailio (OpenSER) and SIP-Router.org. Internet access is nice to have although I can do it from the host OS, having it on guest OS makes everything move faster. The solution I found is to add a second virtual network card to guest OS which is set in NAT, and voila! internet access. Nice! Don't forget to install guest additions, they are marvelous for Ubuntu 9.04 - full screen in the way you barely notice you haven't booted directly Ubuntu.